Spring has definitely come earlier than normal this year for the Dallas area. Who doesn’t love seeing the fresh green buds of leaves on the trees, all the tulips and daffodils in all their glory, wisteria and flowering trees all blooming. It only is for a few weeks that we can enjoy these special florals letting us know that winter is behind us. 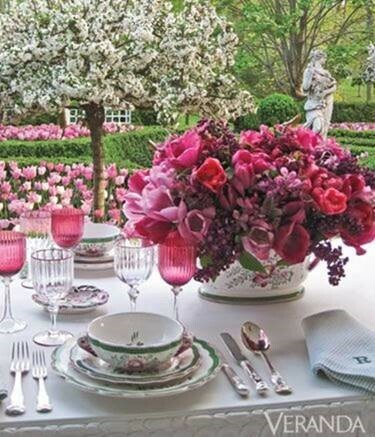 To celebrate spring why not plan an outdoor luncheon or brunch or afternoon tea with friends with a grand bouquet of white viburnum and branches of boxwood or Bradford pear branches? Setting your table with colors of spring with pinks, lavender, mint green and yellows with coordinating monogrammed napkins makes a gorgeous table. Go to http://www.halohomebyksw.com/ to see beautiful linens and monogramming. I would tuck some grape hyacinths tied with a small ribbon in the napkin as well. 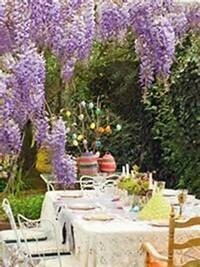 Entertaining outdoors sets a carefree tone that cannot be duplicated at an indoor party. Who can compete with Mother Nature? It is no greater surprise than to use your fine china and glasses outdoors. This setting practically guarantees a good time. Keep your menu simple. Serve mint juleps or Pimm’s for drinks. Remember most of the attention will be directed toward the decorations and surroundings outside. A thirst-quenching, supremely summery drink (in England, it’s a must at cricket matches), Pimm’s Cup, mixes lemony soda (or ginger ale), fruit, cucumbers, mint, and a fortifying shot of gin. Pimm’s No. 1, a gin-based drink, was invented in 1823 by James Pimm, who served it at his oyster bar in London. It is widely available at liquor stores. Take a jug (if you want to make several glasses) or a glass and add as much ice as you like. Pour one part Pimm’s No. 1 with three of fizzy lemonade over the ice. Add mint leaves, thin cucumber slices, orange slices and strawberry (all or some depending on what you prefer) and serve.